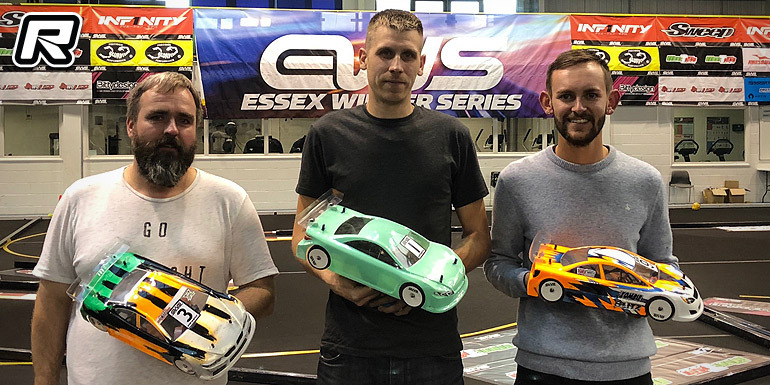 The opening round of the 2018/19 Essex Winter Series took place this weekend. With the series attracting a record number of entries this season, the championship kicked off with a capacity entry. 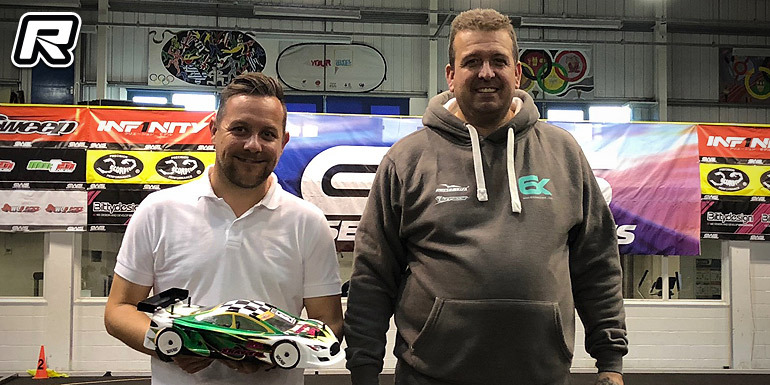 In the Modified class, a number of potential winners had changed teams prior to the start of the series and everyone wanted to get their winter off to the best start possible. Alexander Hagberg added some international flavour to the field, and demonstrated why he is one of the best on-road racers in the world as he opened proceedings with the fastest time in round 1, ahead of his new Xray team-mate Elliott Harper, and defending series champion Olly Jefferies. Alex clearly had his Xray sorted on the new EWS-spec Sweep carpet tyres, and continued his form to top all four rounds of qualifying. The fight for 2nd was between Elliott and Olly, with the advantage eventually falling to the latter as the newly-signed Schumacher driver took the tiebreak after both drivers scored equal points. Behind, the Associated pairing of Alan Bickerstaff (once again supporting the series and traveling from Northern Ireland for each event) and Matthew White locked out 4th and 5th, in front of the now-privateer Stefan Chodzynski. Adding even more international interest to the event, Belgian youngster Florian Joos made the trip over, and was rewarded for his travels with a strong seventh overall after qualifying. The single-leg A-final didn’t go to plan for Alexander, after he clipped the second corner and gave up any advantage he had form his pole position start. This not only allowed Olly to take an early lead, but Alexander then tagged Elliott as his car returned to the track, allowing Alan up into 2nd and Matthew into 3rd. The incident was enough to force Alexander to retire immediately, and left Elliott to try to claw his way back up the field. Both Matthew and Alan did a good job of holding off Elliott for a number of laps each, but the Xray driver eventually managed to find a way past both and then tried to close the gap to Olly. This left Alan and Matthew to fight for the final podium spot with Stefan for the second half of the race, with the verdict eventually going to Alan. Elliott meanwhile tried to close down Olly, but the Schumacher driver did enough to manage the gap and, despite Elliott setting the fastest lap of the race, he wasn’t able to close down his rival before the five minutes elapsed. The Super Stock class always sees close racing, and that proved to be the case in all four rounds of qualifying. Jörg Miikael Tiit, the Estonian driver who is currently living in London for studies, set the best time in the opening round with his Awesomatix, half a second ahead of Tony Broad’s Xray and the ARC of Colin Jackson. 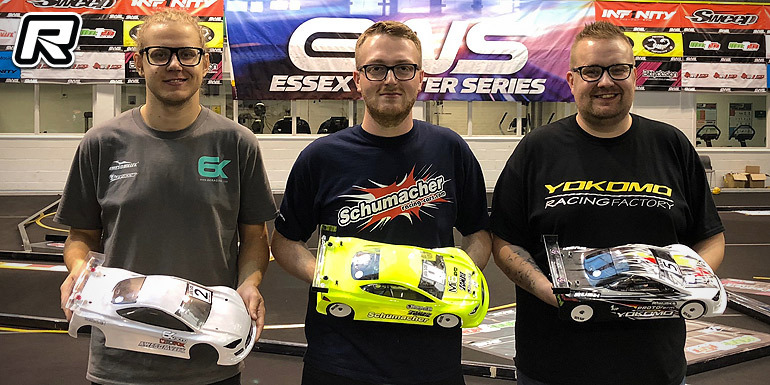 Round two went the way of Colin, with the Schumacher of EWS Champion Zak Finlay taking 2nd, ahead of Jörg and Tony, whilst the penultimate round saw Zak fastest from Yokomo’s Jimmy Maddison, the Xray of Tim Hancock and the Schumacher of James Hart. The final qualifier saw Zak secure pole position by going fastest again, in front of Jörg, James and Tony. The start of the A-final saw plenty of action over the first lap of racing, which allowed the top two to escape and Jimmy to move from 5th up to 3rd. Despite the gaps ebbing and flowing throughout the race, it seemed whenever anyone was able to start closing down the car in front, a small mistake would drop them back before they were close enough to begin thinking about a pass. This kept the racing close and everyone on their game, but ultimately it was stalemate up front and Zak began his title defence with a perfect score, Jörg demonstrated that he can’t be ruled out for a championship challenge in his first year at EWS as he secured 2nd, and Jimmy took the final podium step on his return to the series. Within the Super Stock class, the series also recognises the top Sportsman drivers, those who didn’t make a top-30 result last year, or a top-20 result at a UK National. This was a closely fight throughout the day, with Paul Hill emerging on top with a C-final finish, Tristan Wilby taking 2nd and Rob Brighton third with their D-final results. Newly introduced for this year is a ranking also for Masters (+40 as of the start of the season). Tim Hancock took the first ever victory, thanks to his A-final placing, with Richard King joining him in the A-final to take 2nd. 3rd place was fought out in the B-final, with Darren Lee getting past Marcus Askell just a couple of laps from the end to round out the first EWS Masters podium. This season also sees a new class being added, the Amateur Stock class, for non-sponsored drivers and using a handout 17.5 turn motor with a fixed gear ratio. 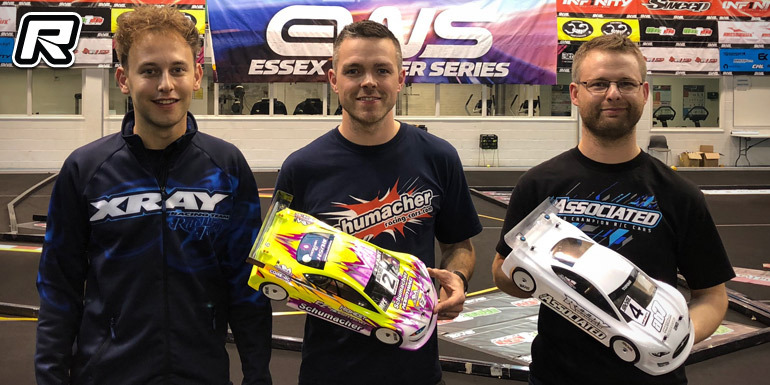 This provided close action throughout, with Billy Kavanagh taking the first qualifier, in front of Dave Lumbis and Adam Malins. Round two had Jonathan Gibbs beating Jamie Murray to take the top spot, with Dave in 3rd. 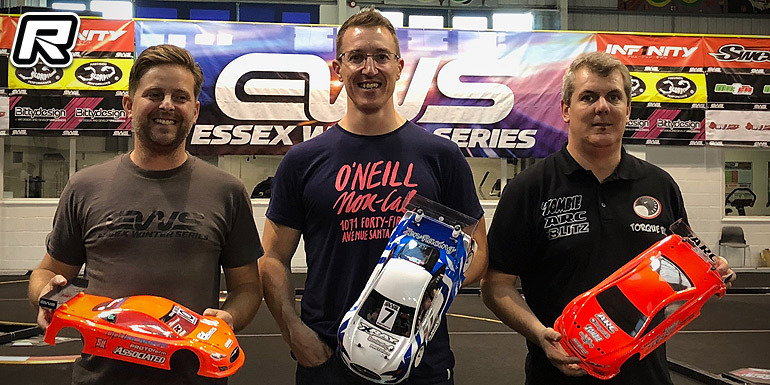 Dave then took the third round, ahead of Jamie and Steven Ellis, whilst Steven then took the last qualifier in front of Jamie and Adam. Dave led the A-final from pole position and built up a small lead and looked like he had the first ever Amateur Stock win in the bag. But in the second half of the race, Billy came back from a poor start to close down the gap, and created a great race over the closing laps until a small mistake from Billy with one lap to go effectively sealed the top two result. Behind, Christian Booth had a great run in the final, coming through from 9th on the grid to slowly pick off cars one-by-one to secure the final podium place, beating out young Shane Chipolina, who is certainly one to expect to see in the top 3 soon. The series continues with Round Two taking place in mid-November, which once again features a fully-booked event.